This is the oldest solar panel in New Hampshire. Sez who? Sez me! In 1979, or maybe it was 1978, Ralph Jimenez and Linda Graham got tired of lighting their off-the-grid home via candles, Coleman lanterns and kerosene lights, and decided to take a high-tech plunge. Thirty-nine years later (or maybe 40, but probably 39), the tech doesn’t seem quite so high but the plunge is still paying off. Their 3.5-amp, 12-volt Kyocera solar panel, bought for $435 after President Jimmy Carter pushed through solar tax credits in the wake of the oil embargo, continues to chug along. As it did when disco was king, the panel is sending a stream of electrons into lead-acid batteries hooked to some DC lights and a tape player that was pulled out of a car and turned into a really cheap home audio system. Incidentally, Monitor readers, I’m talking about that Ralph Jimenez – the paper’s longtime editorial writer. Measurements that Jimenez made earlier this month at the house, which is now a rarely used cabin in the woods, found that on a partly cloudy midafternoon the panel was producing about 24 watts, compared with its rated original maximum of 42 watts. The panel has certainly lost some efficiency over the years, but judging from this I’d guess it hasn’t lost too much. That kind of long-term measurement is useful because financing for solar arrays often assumes a functioning life span of 20 years, and some have wondered if that’s realistic. Call it the advantage of no moving parts. 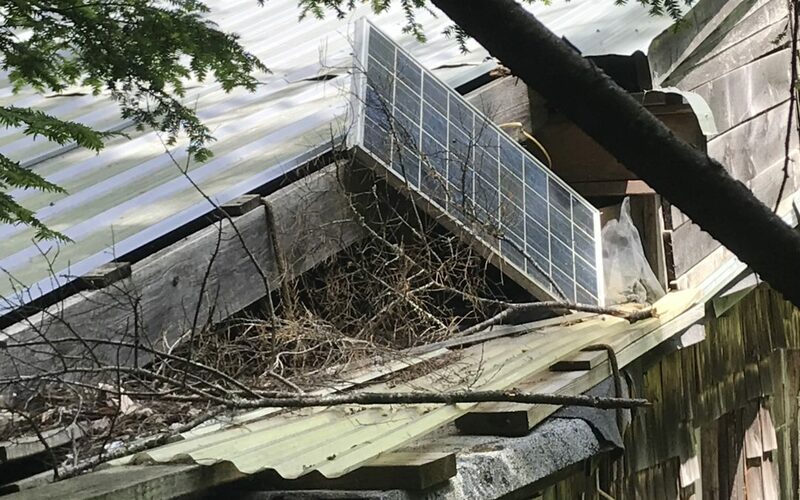 All this is not just technically impressive but also historically impressive, because that little unit sitting precariously on the edge of the roof has been officially declared The Longest Continuously Operating Solar Panel in The State of New Hampshire. Officially declared by me, that is. I’ve been looking for this panel for a long time, partly for novelty’s sake and partly to provide another data point in the debate about how long solar panels work. I have previously found what I believe is the longest operating solar panel on a New Hampshire school and also the longest operating solar panels that are tied into the power grid, but the longest operating panel of all remained elusive. Months of effort, including queries to aging hippies and attempts to contact long-gone stores with “sun” or “solar” as part of their name, had gone nowhere – so it’s a little embarrassing to admit I found the winner by walking about 60 feet from my desk and asking a colleague. Jimenez was a little surprised when I declared that his panel was the state’s oldest because it’s definitely not the first. “I know I wasn’t the first, by any means. We were living the back-to-the-land life, but there were a lot of people doing it,” he said, reminiscing about the days before he and Graham turned bourgeois with a family, a car and a house in Concord. He’s not joking about being back to the land. For years in the cabin, whose exact location they’d prefer to keep quiet, the pair hauled water by hand from a stream, and it was very exciting when they put a 55-gallon drum on the roof that could be filled by a hose to create a little gravity-fed indoor plumbing. They also ran a phone line by hand through the woods, but had to keep fixing it because squirrels would chew through the insulation. But the panel is unquestionably old by solar standards. The first photovoltaic solar cell was created in 1954 and the first rooftop solar cell is generally considered to be a University of Delaware project turned on in 1973, a mere half-dozen years before Jimenez and Graham got theirs. You may wonder how much electricity this Little Panel That Could has produced. I certainly did. I estimated that, over its life, this panel has generated its maximum power for an average of two hours each day. The official solar-sun estimate for Concord is 4.6 hours a day, but this panel has been neglected so much that I’m cutting this figure in half and rounding down. Multiplying 42 watts times two hours per day times 365.25 days per year times 39 years gives the grand total of 1,196,559 watt-hours. Say 1.2 million watt-hours, or 1.2 megawatt-hours. That sounds like a lot, but consider that the Merrimack Station power plant in Bow can produce this much energy in about nine seconds. Put another way, that’s enough energy to power the average New Hampshire home for about two months. But lots of output isn’t the point of a solar panel; creating the right amount of output at the right place is the point. After 39 years – or maybe 40 – I’d have to say that New Hampshire’s Oldest Solar Panel is doing that pretty well. 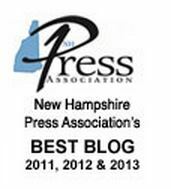 As a VT based solar installer, I found this article to be wonderful! Thank you! Some thoughts… the panel, albeit somewhat neglected, is still producing 24 of 42 watts in 40 years – a1% reduction in output per year. This compares very favorably to today’s panels which lose output at 0.5% – 0.7% per year. Also, the panel cost $10/watt 40 years ago. Today’s panels cost $0.50/watt! By the way, you can find some really old panels at lighthouses and certain Coast Guard stations. Lighthouses and Coast Guard station! Brilliant idea.